"The food in its restaurant was good, staff was friendly, & t..."
Have a question for Clarion Hotel Anaheim Resort? "All the staff are extremely friendly and helpful but I have to single out Stephanie who was always happy and willing to help us." Thinking of planning a trip to Los Angeles? What are you waiting for? 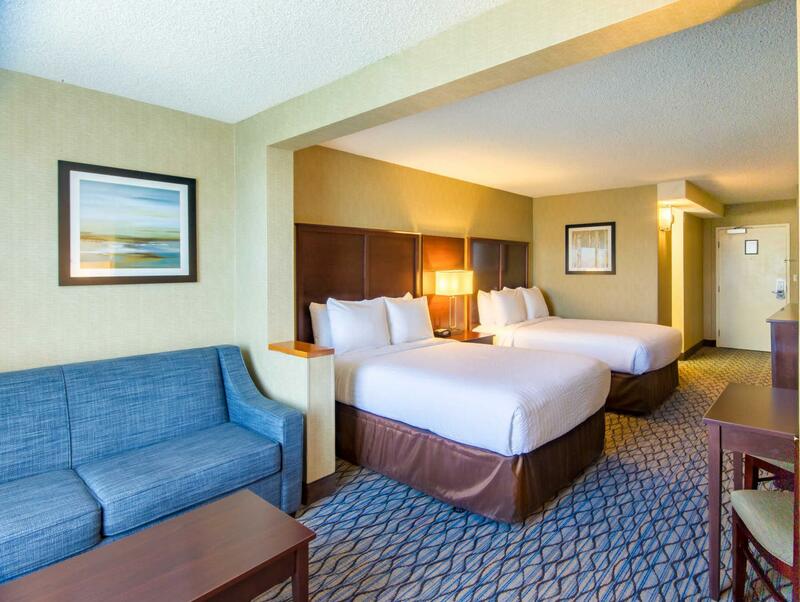 Book your stay at the Clarion Hotel Anaheim Resort for the vacation of your dreams. This hotel has a range of facilities for guests to enjoy, such as a golf course, a fitness center, a spa, a tennis court, and an outdoor swimming pool. It has several convenient features, such as safety deposit boxes, a selection of shops, a currency exchange, and a smoking area. 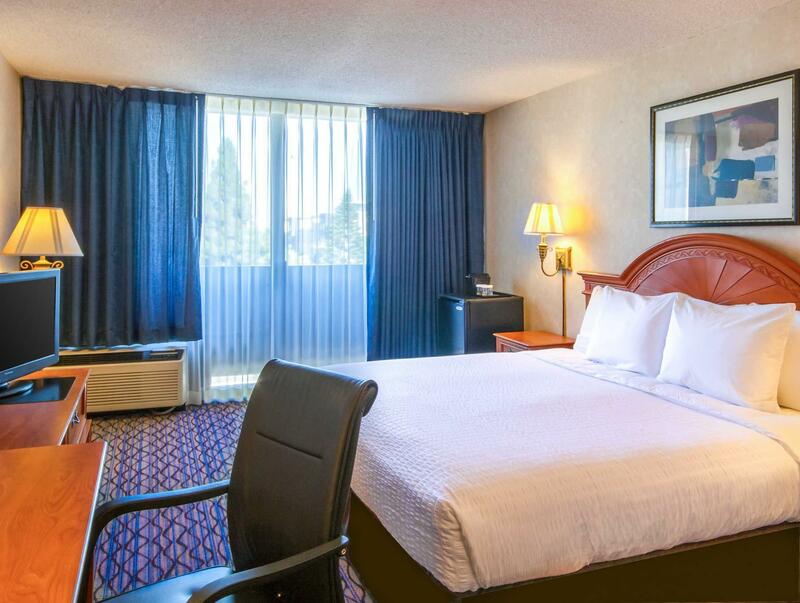 The Clarion Hotel Anaheim Resort offers city views from its rooms, giving you a glimpse of the bustling city roads. All of the rooms come with air conditioning, an in-room safe box, satellite or cable channels, and an alarm clock, as well as a seating area, a bathtub, carpeting, ironing facilities, and more. The Clarion Hotel Anaheim Resort has a bar, restaurants on-site, vending machines, a coffee shop, and room service, so there is a selection of dining and snacking choices. This hotel offers an assortment of transport options, such as airport transfers, car rentals, and shuttle services. From dry cleaning services to daily housekeeping, it offers a range of useful services to ensure that you get the most out of your stay in Anaheim. It has free Wi-Fi in all rooms, in addition to Wi-Fi in common areas, so visitors can stay in contact with their friends and family back home without splashing out on foreign data charges. 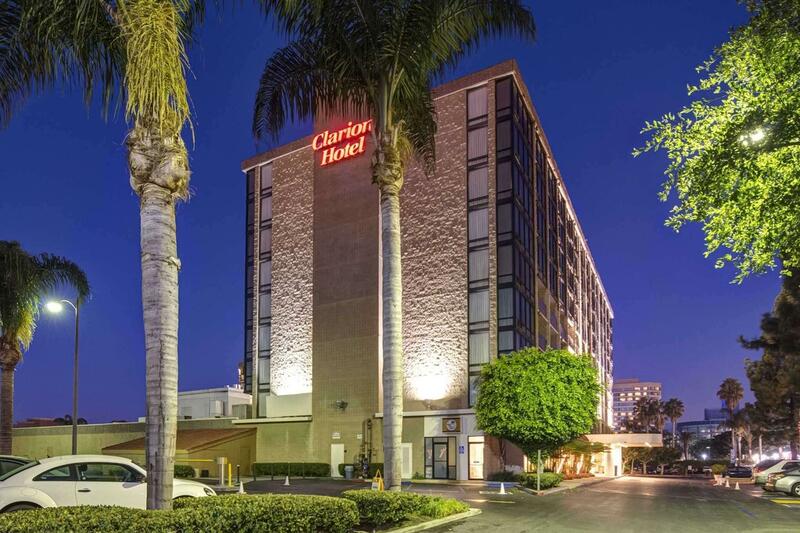 The Clarion Hotel Anaheim Resort features an around-the-clock front desk, ensuring that there is always someone on call to help you. It accommodates pets, so you don't have to deal with the stress of finding a pet sitter. The Clarion Hotel Anaheim Resort has a kids club, offering parents a secure childcare option to keep their little ones busy. Anaheim Amtrak Train Station is 3.6 km away. The nearest airports are Fullerton Municipal Airport (FUL) and John Wayne Airport (SNA), which are located 9.8 km and 14.2 km away. "At reasonable distance from DL and good pool." My group of 9 booked 2 rooms at this hotel for a nearby convention. Location was great, but that was about it. One of our rooms had an overflowing toilet late at night and they said they had no staff on hand to clean it up. But even the next day, it was still not cleaned up and we had to all use the other room's shower. Location was good, room was clean the only downside to this hotel was the food available in the restaurant it was terrible. At reasonable distance from DL and good pool. The double beds are very small, can no way manage two persons. We booked a room for 5 persons but cannot manage five persons with the given beds/sofa bed, needed spreadsheet to manage someone sleeping on the floor. Wash room is also quite small. The lighting is quite poor and insufficient. The staff wasn't friendly with us . I don't usually provide reviews but the hotel staff totally looked after me travelling solo from check in to departure. Very comfortable and safe stay. Thanks again. Lacks of basic ammenities like slippers, toothbrushes and even showercap. They do have washer and dryers thou. The carpets can be updated and the rooms have an odd smell, but overall this was great for the location. Right across the street from toy story parking lot so no need to park of going to Disneyland and also within a block or two of Target to do some grocery shopping. Only were in our room at night to sleep. I arrived at the hotel at 9am after an overnight flight with checkin not being until 3pm. We were simply going to ask to have our bags stored and then come back later to checkin. But knowing we had flown overnight from Australia the staff member immediately provided us with a room at no extra charge. All the staff are extremely friendly and helpful but I have to single out Stephanie who was always happy and willing to help us. Stephanie always has a smile on her face and made us feel extremely welcome. Please ensure that she is adequately recognized for the amazing service she provides. Location is good. But The shower is very very very very small because the hotel needs to save water for CA. It took us spend double time to finish shower. The parking card has trouble and you"ll need to ask front desk to change for you for letting your car out. The hotel not really has their own shuttle, it was the public transportation bus so you can buy the ticket in the hotel. The Filipina young lady was so helpful, as well as the Latina ladies. Great standard hotel only a few blocks from Disneyland. The food in its restaurant was good, staff was friendly, & the room was clean. The hotel do need some renovation! Good location and access to convention center and all activity in Anaheim. I enjoyed staying at the hotel. It was conviently located to the event we were going to.